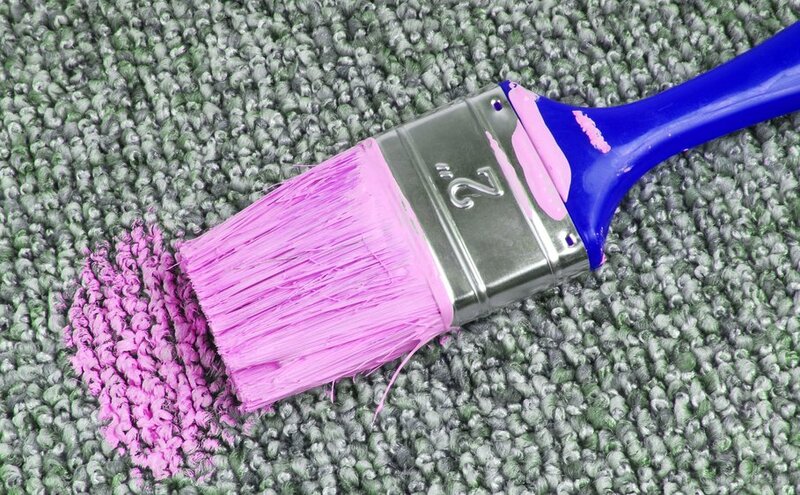 There are so many ways to paint can end up on your carpet so it wouldn’t be fair to pick one scenario for the introduction. Sure, some of them are stand-up comedy worthy, others are just plain ludicrous, but they all end the same way – with an undesirable stain from spilt paint on your nice carpet. But don’t panic, not all is lost. In this article, we are going to take a look at the different methods you can use for getting paint out of carpets. Most paints have three main components: a pigment, a binder and a solvent, and to improve the paint’s qualities, sometimes an additive is included. The cleaning method and the amount of your effort involved during the cleanup stage largely depend on the type of solvent in the paint. There are two kinds of solvents – water and oil. If it’s water, you’ll be able to easily clean up the mess on your carpet. However, if the solvent is oil-based, you will need a paint thinner to dissolve the stain. And while dried oil-based paint spots are not impossible to remove, the cleaning process can be tedious and time-consuming and often professional help is required for a complete removal. Always wear protective gloves, safety glasses, and a face mask when using harsh cleaning products or solvents. Before you try any of the methods, first, check with your carpet care guide whether it’s suitable for your rug. Always test spot removal solutions for colour fastness on an inconspicuous area of your textile floor covering. Don’t rub the surface, blot it instead. To prevent further spreading of the stain, work your way from the outer edges to the centre of the affected area. Don’t use dry vacuum cleaners to clean up liquids. Unlike dry cleaners, wet vacuum cleaners are waterproof and their most important parts are well-protected against water and other liquids. Be extra careful when you use strong cleaning products on wool carpets. Professional carpet cleaners have the proper equipment and the know-how of dealing with stubborn stains. Including ones caused by paint, milk products, blood, wax (hair removal, crayon, soy), wine, and more. Below you’ll find step-by-step guides on how to remove general water-based, acrylic, and oil-based paints out of your carpeting. Bear in mind, that dried up dye tends to be a bit harder and time-consuming to get rid of. If the paint stain is still fresh, just blot it with a paper towel. Never scrub, you’ll make it worse. If the paint stain is dry, mix hot water and a little bit of dish detergent, pour the mixture into a spray bottle and shake well. Mist the stained area and let the solution sit for a few minutes to weaken the paint. Once the paint has softened, use a dull knife or a pin to scrape off what remains of the stain. Continue to add solution while you scrape. If the paint is still dry, consider using a handheld steamer while you scrape to further loosen the paint stain from the carpet. Blot the treated area with a clean rag using the solution from above, then vacuum the rug to lift the fibres. You can use a cloth or a rag instead of a paper towel, just make sure it’s white because coloured fabrics can transfer their dye to the carpet and make things worse. Some of the water-based paints include emulsion, watercolour and chalkboard paint. The process of cleaning water-based paint stains is relatively simple. Although water-borne paints dry quicker than oil-based ones, the cleanup is much easier. A good rule of thumb is that if the instructions on the paint tin state to wash your brushes in warm water, then the paint is water-based. If the paint is still wet, simply blot the surface using a paper towel dipped in water. If the paint spot is dry, brush it with the help of a toothbrush. Scrape the loosened chunks of paint carefully with needle-nose pliers or a pin. Dampen a rag and wet the spot first, then blot the paint stain with a mixture of laundry detergent and warm water. Again, don’t scrub the spot, just gently tap it. If the paint stain remains solid, moisten a rag with a bit of acetone and pat the spot to dissolve the paint. Blot the stained area again using the solution of laundry detergent and warm water. If needed, repeat the whole process. Vacuum the carpet once it’s dry to lift the fibres up. Acrylic paint is water-soluble but becomes water-resistant when it dries. You will need a solution that is capable of dissolving the acrylic resin. In this case, acetone is used. Alternatively, you can use isopropyl alcohol, nail polish remover, WD-40, or a citrus-based dissolving agent and follow the same steps. If you can’t get a hold on none of these, many carpet lovers across the web claim to have successfully removed paint stains using “Goo Off”. Be careful when using acetone on carpets! Avoid oversaturating the carpet, as it can penetrate to the backing and disintegrate the latex bond. Acetone is highly flammable and can cause dizziness if inhaled. Keep spaces well ventilated when using it. Store acetone away from heaters and out of children’s reach. Gently dab the spot to remove as much fresh paint as possible. Don’t scrub in order to avoid forcing the paint deeper in between the carpet fibres. Soak the stained area by the use of a mixture of one cup of warm water and one teaspoon of non-alkali dishwashing detergent. If the paint has dried, scrape off as much as you can with a knife. Remove or loosen large spots with needle-nose pliers and saturate the affected area with water. Vacuum with a wet/dry vacuum. If the stain is on the stubborn side, consider using a steam iron to clean the tinted area. Don’t place the iron directly on the carpet. Simply hold it over and allow the steam to further loosen the paint. Blot again with a clean cloth using the solution from above. Work from the outside edges of the dye spot to the centre, gently dabbing the area. Once the carpet is dry, vacuum the treated zone to freshen the fibres. Latex paint is another example of water-based paint. As long as it hasn’t been dry for a long time, you can successfully take it out. If the stain is still visible, follow the steps for cleaning oil-based paint stains below. Dab, don’t scrub, the stain with a cloth or paper towel dampened in the prescribed thinning solvent for the paint. If not possible, apply a small amount of turpentine to the affected area. If the oil paint stain is dry, apply steam to the stain to soften it with the assistance of a portable steamer. If you don’t have one in your possession, blot with a clean rag using one of the solvents described above. Gently try to break up the dried paint with a needle or pin. Take your time, so you don’t damage the carpet fibres. Blot and pick up the dried particles until the stain is removed. Rinse the area using a solution of mild dishwashing detergent and lukewarm water. Once dry, vacuum the carpet to rejuvenate the fibres. In case you are dealing with a stain from gloss paint, you can follow the same steps to get it out of your carpet. Dried-on oil paint on carpets can be a real pain in the neck. The paint may not fully disappear and applying solvents puts you at the risk of damaging the rug even further. Still, solvents are the only effective remedy against oil-based paint. If this method doesn’t help, consider using the services of a professional carpet cleaner. Turpentine is highly inflammable and gives off highly toxic fumes in a fire. It is able to dissolve plastic and rubber and can cause skin irritation, that’s why it’s important to wear protective gear. 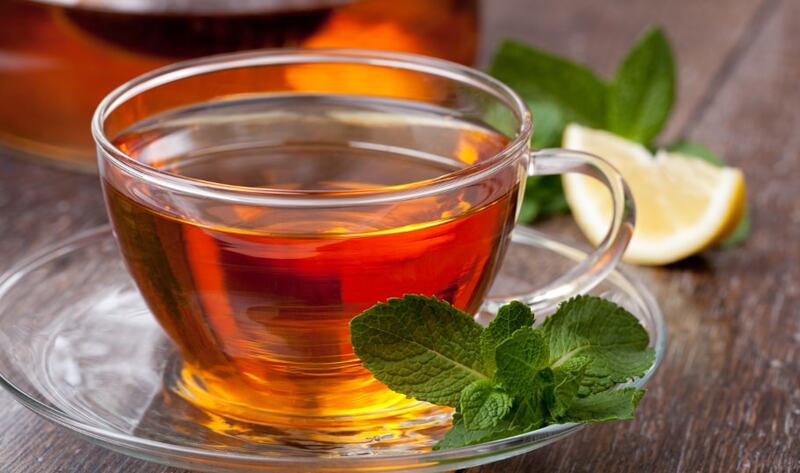 It is advised to store turpentine separately from oxidants like hydrogen peroxide, sulfuric acid and etc. Keep it in a well-ventilated space and away from children. If you’re interested in more tips on how to maintain your carpet, check out our post on the topic. It offers helpful information on how to clean a dirty carpet and provide you with handy upkeep tips. In case you’ve tried everything, including the methods above, it may be time to turn to a professional. The carpet cleaning technicians will treat the paint stain with specialised products that you can’t find on the shelves of the local market. We here at Fantastic Services can offer you two effective carpet cleaning methods – hot water extraction and dry cleaning. Not only that, but we can also apply a thin layer of a stain protection product to prolong the effect of our services. Got paint on carpet? Don’t worry. Let the carpet cleaning expert remove it for you. Click more to learn about our cleaning methods, get expert advice or receive a free quote. Q: Okay, I have this paint stain on my bedroom carpet from the day I’ve moved in, how do I know if it’s water or oil-based? A: Good question. When not sure whether the stain is from water-based or oil-based paint, always use the water-based paint cleaning method, simply because it is more fibre-friendly. If it doesn’t work, then proceed to the oil-based paint cleaning method using solvents. 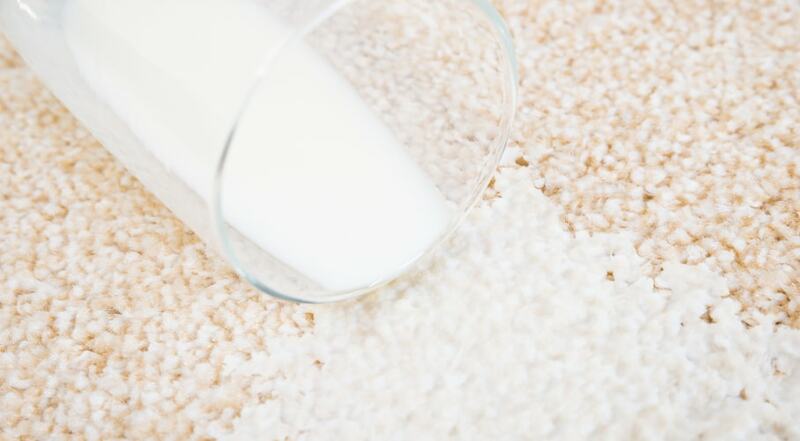 No matter of the cleaning method, remember to always do a small spot test on hidden part of your carpet. Depending on the size, nature, and age of the stain, some of them might be impossible to remove. We cannot take responsibility if any of the above-mentioned methods do not work on your carpets.